This is the third in a series of 6 posts on our perspective on sustainability, and deals with the notion of ‘Common Good’ in contrast to ‘Self-Interest’, and why the pursuit of the Common Good leads to better sustainability. Our first post focused on our definition of sustainability while the second went into details on what exactly we mean by ’social relevance’, ‘environmental responsiveness’ and ‘economic viability’. Why should anyone want to focus on the so-called ‘Common Good’? What is wrong with plain old ‘Self-interest’? Is one approach sustainable and not the other? Interesting question, because it helps get to the very root of the matter. Self-interest is a very interesting principle. It is the most natural, the most Darwinian if you like, principle that you see in nature. Seen in the context of humans, it has the potential to evolve from its more primitive and instinctive version i.e., seeking to derive benefit to self by directly accessing value, to a more mature and rational version i.e., seeking to derive benefit to self through value returned by contribution to the ecosystem around self. Animals are not sapient beings and cannot possibly behave in a manner that reflects the latter version, but humans have an opportunity to transcend instinct, act rationally and move towards a better world. In its more evolved form, the principle of Self-interest becomes synonymous with the principle of Common Good – so it is no different, in essence. Do bear in mind that nowhere have we touched upon the concept of charity or philanthropy. 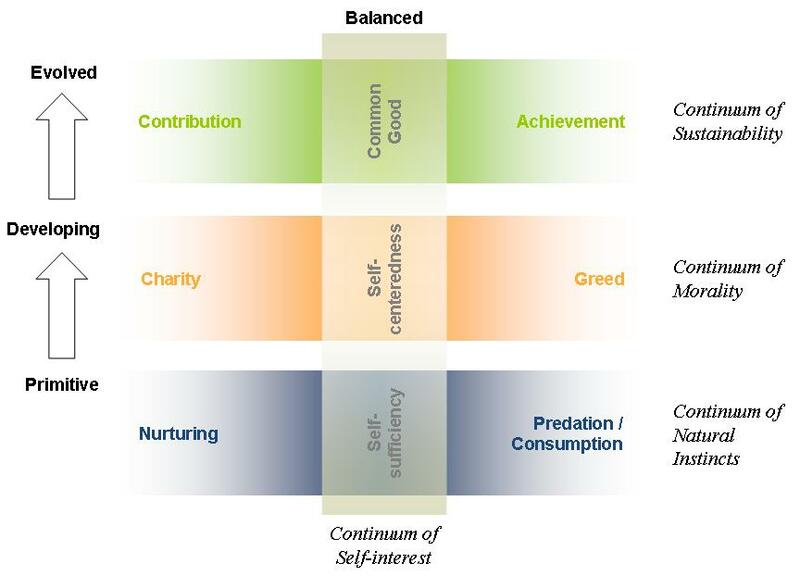 Self-interest alone is good enough and will support sustainability, provided it sublimates into its more evolved form. This line of thinking is consistent with age-old homilies such as: ‘You reap what you sow’ or ‘As you give, so you get’ or ‘What goes around comes around’, which are simplified versions of similar thoughts. In order to test whether a strategy or policy or an approach or a principle, let’s call it X, is sustainable, one may simply ask the question: ‘If everyone were to follow or practise X would it lead to a more prosperous, harmonious and better world?’ and if the answer is in the affirmative, then we may conclude that X is a sustainable idea. While on old aphorisms here’s another adage that resonates with this test: ‘Do unto others as you would have others do unto you’. If everyone were to act in the interest of common good it is likely to result in a feeling of abundance in the long run, whereas if everyone acted out of primitive self-interest it is likely to result in a feeling of scarcity, given the same amount of wealth in the system. Apply the sustainability test to other impulses such as Greed or Cheating, and verify the results for yourself. Greed is not a sustainable strategy, and neither is Cheating – the global economic crisis bears testimony to that. It is possible that a few have benefited from it in the short run, and we are not passing moral judgement on them here. All we’re saying is that it is not sustainable. Again, let’s be clear that this is about the plain and simple economics of longevity, not about morality or religion! The next post in this series will discuss the challenge of sustainability in a competitive situation and will elaborate upon the difference between partnerships and competitive relationships.